Tunku Abdul Rahman Park, Kota Kinabalu: Downbelow recently hosted a group of 24 people from Japan on Gaya island for some Discover SCUBA Diving action and general fun in the sun. 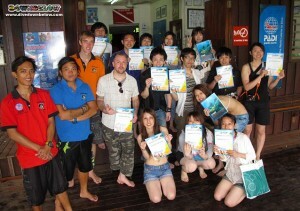 Of the 24 strong group, 14 took to the waters of the Tunku Abdul Rahman Park in front of the Gaya Island Beach House to do Discover SCUBA Diving. The remaining 10 spent their day snorkeling and playing football on the grass pitch and enjoyed the paradise setting of our dive centre. Our Discover SCUBA Diving program is very popular with groups, as it allows even people who have never dived before to go from dry to 12m deep in just a few short hours. And when you check out our PADI 5 Star IDC Dive Centre on Gaya Island, you’ll realise that the waters around it just begs to be dived. Of course, for non divers we also offer our equally popular snorkeling program – it’s an all inclusive package, which is much better value compared to trying to DIY something similar on one of the other islands. Our package is hassle free and includes a trained snorkeling guide, coffee, tea & biscuits all day, a freshly cooked lunch, transfers from your hotel in Kota Kinabalu, boat transfers and park fees, all at uncrowded facilities set against a beautiful rainforest jungle backdrop. You will, as our group from Japan did, thoroughly enjoy day on the island with us, wether as an individual or group, small or large. If you would like to join us on the island for diving courses, snorkeling or a bit of jungle trekking, get in touch with us or email us directly and we’ll hook you up.